Have you ever invested in a course or program with high hopes only to have it fall flat? Maybe it over promised and under delivered, or you lost interest and put it on the shelf for “someday” (aka never). Now imagine the opposite scenario: you invest in a course and within months, generate 28 times the initial cost! Today’s guest, Crickets to Customers student alumni Lee Chaix McDonnough, tells us exactly how she did just that. Lee is a coach for spiritual minded business owners, and author of the book ACT On Your Business. After spending 15 years in the fields of social work and public health, Lee pivoted to pursue a coaching career. 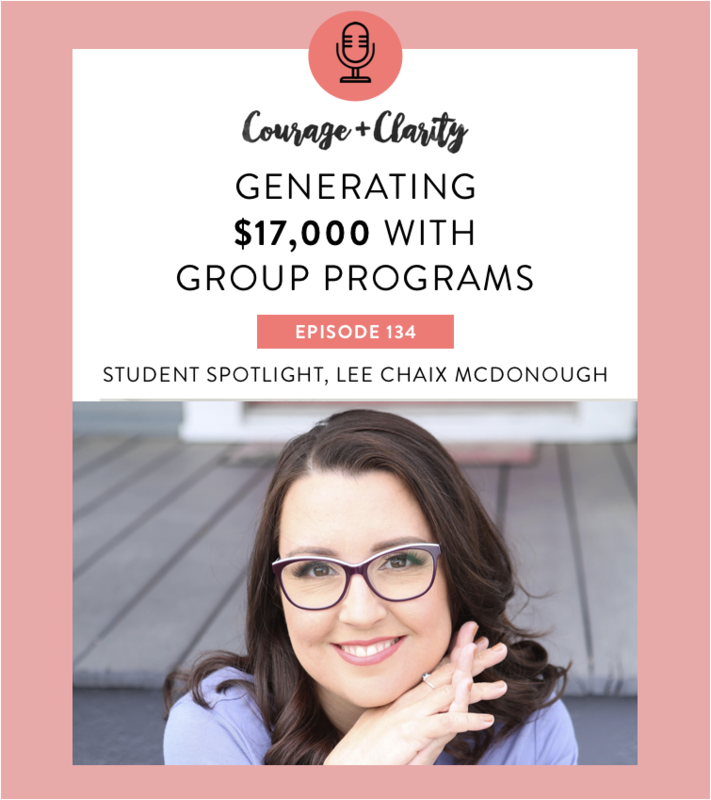 In the Courage portion of this episode, Lee walks us through her first year of business, and reveals the mistakes she made along the way. She realized her business decisions were rooted in fear - and as a result she had created a corporate looking and sounding business that wasn’t in alignment with the real her or who she was meant to serve. She was looking outside of herself for answers, instead of owning her natural strengths and infusing in her biz. With this in mind, she realigned her coaching practice to serve her ideal clients. Lee’s Clarity Episode is a juicy one! While Lee had built a thriving 1:1 coaching business, she saw a need to add another service to her offerings. In August 2018, after being one of my earliest podcast listeners and C&C Community members, she took the plunge and joined Crickets to Customers. What took place for her to generate over $17000 in the 7 months since she first joined C2C! Are you ready to take your next best step in building a business you love? Doors are now open for my signature course Crickets to Customers until Thursday April 18, 2019! Join the only live track version of Crickets to Customers available this year! I love interviewing my students to share their inspiring success stories! Today I’m chatting with Meghan Chomut, Certified Financial Planner, super-mom of four (!) and Crickets to Customers alumni. Megan’s story is sure to uplift you. She’ll show you just what’s possible when you listen to what your customers really want and take steady steps towards launching a group program. In 2017, Meghan unexpectedly found herself applying for new jobs in her career field of financial planning. Even with ten years of experience, she quickly realized- if she was going to work for another company, she had to start at the bottom and work her way up. This was just the push she needed to start her own business and begin her journey of online entrepreneurship. Living in a city in Northern Canada, face to face networking opportunities were slim. But Meghan took it upon herself to reach out to others in her field online and get to know them. She even joined a Mastermind, and leveraged the power of having a community rallying around you. Meghan’s story is proof that when you commit expanding beyond your comfort zone, and take action on your dreams - you can achieve great things. This success story is super timely, as I’m re-opening the doors to my signature program Crickets to Customers on April 12, 2019! Click here to join the Crickets to Customers wait list. Have you bought a course with the best of intentions but never get around to taking action on it? Maybe you've got a collection of online marketing books collecting dust on your bookshelf. Yep, we've all been there. If you're scared you'll waste of money and nervous to keep investing in yourself, this episode’s for you! Sarah Peck, the brilliant woman behind Startup Pregnant, is here to give her best tips and tricks so you can get the most out of your continued education. You'll leave this episode with a complete re-frame of how you look at the books and courses you purchase in the future. Why finishing the thing (course, workbook, video) isn’t always the most important goal. How to determine the real value of your investment beyond the price per minute. The reason a bookshelf half full of books you haven’t read can actually be a good thing. I loved this conversation with Sarah so much, and bet it will give you a fresh and empowering perspective on the courses and books you buy. You get to define what success if for you! Crickets to Customers - early bird enrollment open now! So You Flopped: Should You Rework It Or Scrap It & Move On? Well friends, the Fix a Flop Series is a wrap! Today’s episode brings it all home with my biggest lessons and learnings from this process. Most importantly, I’ll let you know how you can learn from my mistakes and be ready to take on challenges like this with a lighter attitude and a better chance of success! When do you decide to scrap your idea and move on? What's energy got to do with your ability to have a successful launch? Why is it so important that you know your worst case scenario? I’ve loved sharing the behind the scenes with you about what it really takes to turn a failing product launch around. Plus the biggest lesson I'll take with me out of this whole process... and how it will shape how I work in the future! If this series hit a cord with you, make sure you’re a part of my free community over on Facebook, The Courage & Clarity Community. It’s full of awesome people just like you, who are learning how to balance the head and the heart of building a business they actually care about. You can request to join here! Welcome back to episode two of three in my Fix a Flop Series! Be sure to go back and listen to CC127 for the background story of how this series came to be - it’s required listening for you to get the most out of this episode. So, what do you do when you realize your expectations for a launch aren’t exactly on track? Today I’m sharing everything I did to course correct my launch of the 90 Day Planner Intensive between my first webinar on a Monday (with zero signups) to my Thursday and Friday webinars. If you’re headed for a flop, it’s important to acknowledge and allow the disappointment you feel - because it’s going to hurt. The key is to not wallow for too long. Instead, give yourself space to be bummed before you pick yourself up, dust yourself off and do something about it. Diagnose where the problem is, break it down. Where are you missing the mark? Get outside of your own head - get feedback as soon as possible. I’ll tell you the three groups of people I relied on and who you should leverage when needed. Compare feedback and find common threads. Tweak and rework wherever needed, and bring it back to people that gave feedback. Get your updated work out in front of as many people as possible and watch closely if it produces different results. Continue this process until you figure it out. Next week tune in and we’ll get into the post mortem where I’ll unpack and analyze the whole process. Plus I’ll discuss how to decide if you should rework or scrap your idea completely. Fizzle - try it for free! Today I want to normalize when you’re on the verge of what feels like a business catastrophe. I’m spilling the backstory of my latest launch – and how it had flop written all over it. Often stories shared on podcasts are inspiring successes and include the “best of” side of entrepreneurship. It makes sense, it’s way more fun to talk about the highlights rather than the tough moments. Real talk: it’s only a matter of time before something you offer doesn’t match your expectations. I recently launched my new course The 90 Day Planner Intensive. After an incredibly engaged and exciting webinar (the first of three) and I opened my email program to see… zero sales. Uh oh, something was wrong and there was no time to panic, I needed to take action and fix it. After ease-fully filling my group coaching programs, my signature course Crickets to Customers as well as having a full roster of 1:1 clients over the past year, I can honestly say I’ve learned more and gained more confidence by fixing my almost flop! Stay tuned for the next two parts of this series – next week I’ll share everything I did to fix my almost flop. Then after that I’ll go through a full post mortem of this whole process. How much impact could you make on your business in 90 days? On today’s episode I share how planning in 90 day increments is a sweet spot that can help you see your biggest results. Think about it - 90 days is long enough to make a huge impact but it’s not so big that you’re overwhelmed and get frozen. I hear time and time again that making an amazing plan isn’t the tough part - it’s actually sticking to the plan! In this episode you’ll hear how my 90 Day Planner Intensive will help a cohort of brave business owners have an incredibly productive three months. I challenge every listener to try something different, to get out there and stop trying to go this path alone! I'm excited to introduce you to two of my students, Amanda McKinney and Jessica Kinsey. They've taken accountability partnership to a whole new level! Jessica runs prodigyandco.com, where she supports not-for-profits make a bigger impact and achieve incredible results. Amanda runs ammarketing.com, where she shows yoga teachers how to stay connected to their values while running a sustainable and profitable business. While they're busy running their own businesses, they share an office space and even get coached by me together. On this episode you'll hear why an accountability partner is more than just a cheerleader - it's a business asset! You'll love hearing their unique experiences and I bet you'll be inspired you to go out and find your perfect accountability partner if you haven't already! Megan Hale is back on the mic with Steph in the first Business Wisdom episode of 2019! Together they share their perspectives on how to stay on track through the unavoidable challenges you'll face as you grow your business. Steph asked The Courage and Clarity community "where are you struggling when it comes to accountability and your big goals?" and boy did you deliver some great questions! Macro vs micro goals - how do you take a big ol' dream and break it down into what needs to happen on a daily or weekly basis? This episode if full of Steph and Megan magic! You'll feel not only inspired, but also ready to show up and be accountable in your business. Fizzle - try it for free for 14 days! It’s a timely topic for this time of the year – as the fresh energy and shininess of the New Year fades into the reality that is… life. Today I’m sharing 5 great tips to help you set the right kind of goals, and hit them even when everyday life throws its normal curve balls at you. 2) Chunking down bigger goals + how to implement weekly habits to make steady progress on them. 3) How to Measure Progress so that you don’t feel like you’re just going around in circles! 4) Good Better Best - a simple framework to set healthier goals that will have you celebrating more often and seeing more success. 5) Sharing with someone - why having an accountability partner is crucial as you build your business. Laying out your business plans is only a small part of the big picture. Follow the five tips in this episode so you can pull those plans into reality! Daily Harvest – get three cups for free on your first order! Well, it’s official, my podcast is a toddler! These past two years have been such an amazing journey. There are so many brilliant episodes and guests it was hard to pick just five to highlight this week, but I really think there’s something here for everyone. A big heartfelt thank you to everyone who has downloaded an episode, left a review on ITunes, followed me on Instagram or contributed in The C&C Community. None of this would be possible without YOU. Now it’s time to check out these five killer episodes! How would you like to start 2019 with a clear desk AND a clean slate? 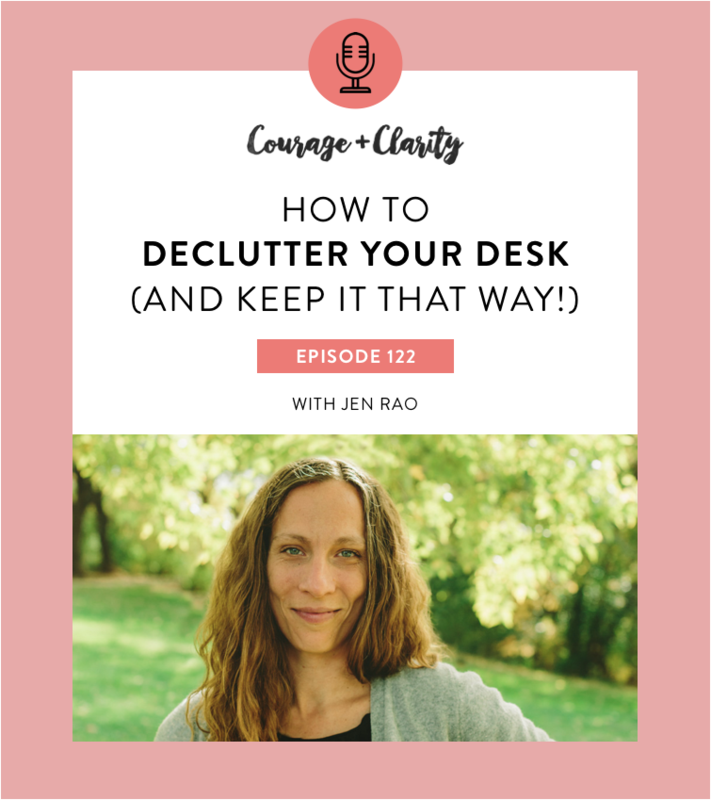 My guest this week is Jen Rao, and she'll help turn your home office space into an uncluttered area of inspiration. One where you can build your business with confidence and without the stress of never being able to find anything! Intentions: we discuss how to set a strong emotion based intention, which is the key to creating sustainable results. And for my woo-woo naysayers out there, hang with us through this mindset work. Jen and I get deep into how this practice can create concrete results for you! Projects: learn how to break down your office space into smaller, more manageable projects to beat overwhelm and see results quickly. Habits: once you’ve put in the effort of clearing your office space, learn how habits are the secret to keeping your space just how you want it! As we hit the new year running, let’s forget about trying to become something we’re not, or striving for picture perfect ideals that may always be out of reach. This episode will inspire you to create your best space, while working with and appreciating what you’ve already got. To celebrate another trip around the sun, I’m getting reflective and sharing my most honest answers to 5 of the questions I hear the most of from my clients and community. Join me as I take a look back at 2018 and answer my community's most common questions. My take on money mindset and how to master it even if you’re tired of hearing about it! This episode’s a juicy one, have a listen and then head over to the Courage and Clarity Community and let me know your biggest takeaway! Fizzle - get a month free! I hate sales. I swear I hear these three words (or a variation of them) on a weekly basis. Which is really a shame, because in order to make that dream business of yours a reality? You’re going to have to make some sales. Today on this first ever live episode, I’m breaking down all of the fears associated with selling - and giving my absolute best tips and tricks to sell with ease. Let’s transform the vision we have of selling from cheesy sales person to effortless value provider. Sounds good right? Loved this episode and want to check out a live broadcast of an upcoming C&C podcast? Join my free Facebook community so you can get in on the fun. After I finish recording, I open the floor to questions exclusive to the members who’re joining me live! Today on the show Shunta Grant shares a hefty dose of inspiration to follow your flow and create a life you truly love. She's a master at creating and nurturing loyal customers because her business decisions come from the heart. Think your niche is too crowded or you’re too late to the party? Shunta’s here to show you how to make such an impression on your true fans that you’ll be all they choose! Shunta is the owner of Because of Zoe, a hair bow company she started on accident before she left her job as a lawyer. 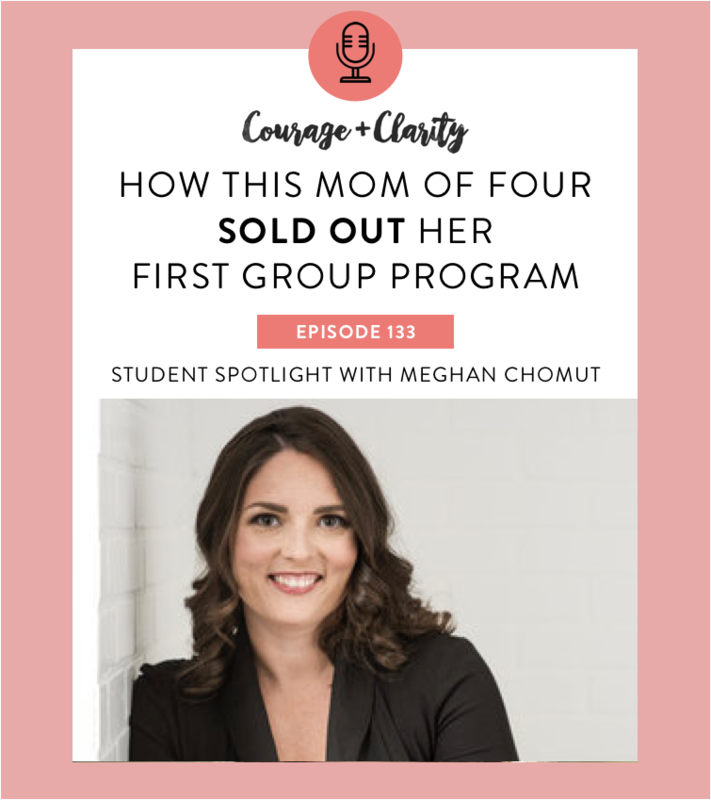 In her Courage story you’ll hear how she leverages connection and community within her fan base and creates what she calls her Loyal League. 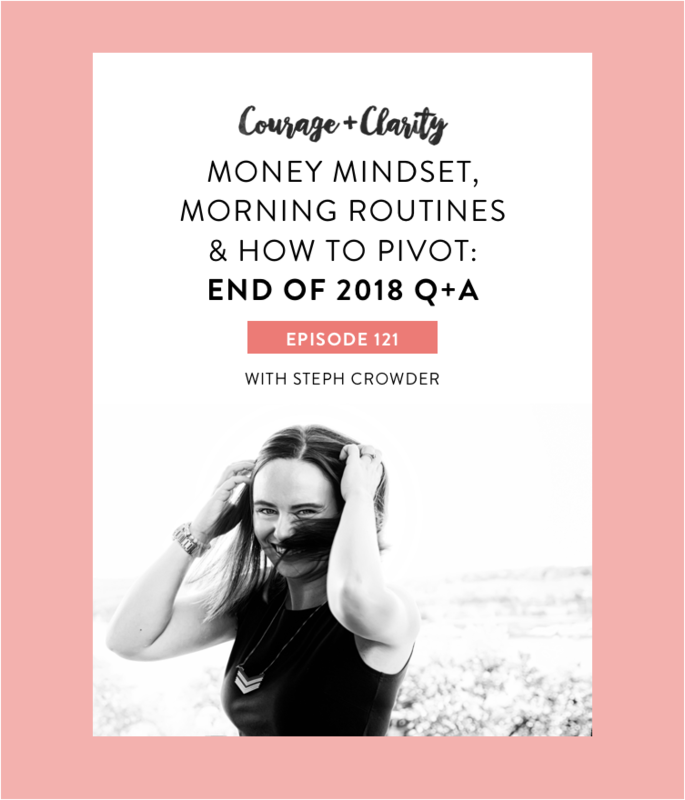 In her Clarity episode we dig into her action packed advice to get to the other side of busy, which she's turned into her second successful business! This episode if packed full of inspiring insights and actionable advice - plus Shunta has a special offer for you! Head over to springforwardworkshop.com and use the code “courage” to get a special price on her amazing course! What kind of success are you chasing in your business right now? To finally make x amount of income, or hit a certain number of subscribers on your email list? Maybe it’s to sell out your course or coaching program. The hope is: hit your external goals and everything will be great. Your worries will go away. Stress will disappear! If this sounds about right, it’s time for a reality check. 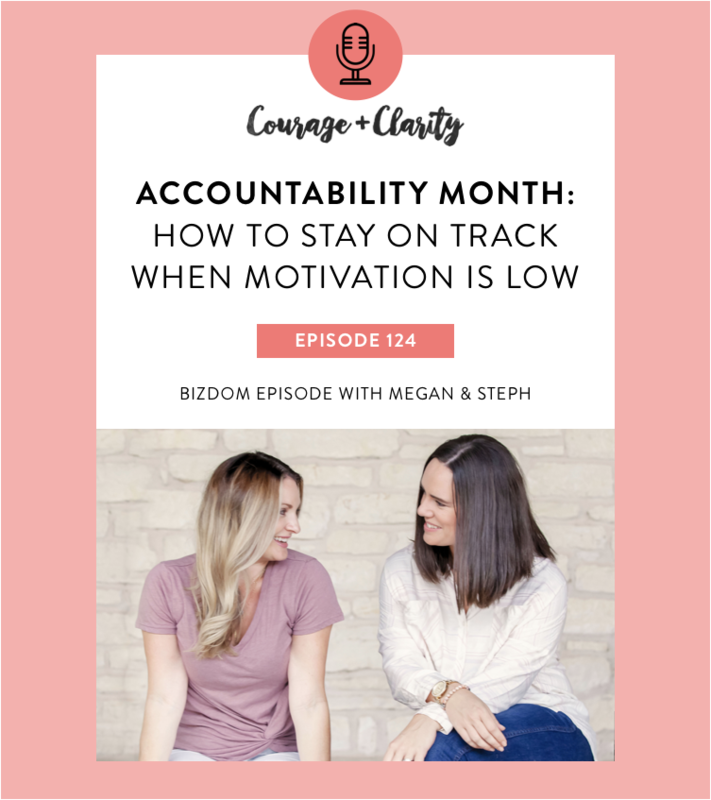 Steph and Megan are back on Courage and Clarity, spilling all of their truths. They take an honest look back on the highs and lows they’ve experienced in 2018. While this year has brought on multitudes of outward success for them both, you’ll hear how that didn’t magically make their struggles go away. It’s important as entrepreneurs that you hear the other side of the story. 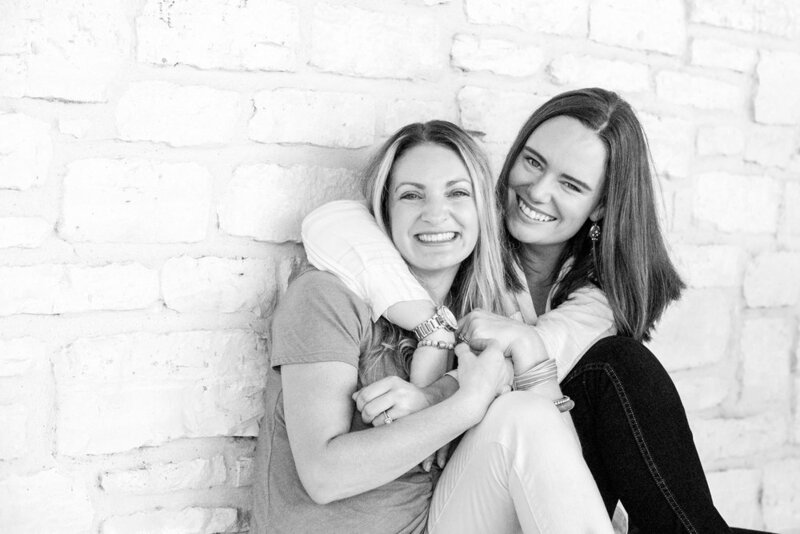 Both Megan and Steph share what inner work they focus on to meet these struggles and challenges and how you can too. Plus learn why good, better, best goals are essential in your business and how you can join Megan’s free training to master them. Join Megan’s free workshop on good better best goals! If you’re like me and most entrepreneurs, you dream of success and living a happy life on your own terms. But how do you achieve this if every step of your journey you have to battle your own old programming? Success doesn’t make everything better. You need to learn how to enjoy the process too. So today Jessica Eley is back on the show! She’s a mindset coach for high achievers (did I mention she’s also my coach?) with an abundance of wisdom that I know you’re going to love. You’ll hear about my specific challenges when it comes to mindset and how I’m working through them (no secrets here!). Today we’re diving into Jessica’s four quadrants theory to find out what fear is holding us back from the life and biz we want. Once you know where you land, this episode explains how to address your triggered reactions in a mindful and productive way. Plus we discuss why all entrepreneurs need to master the skills of detachment and ownership in order to not only succeed, but to enjoy their success! You can head over to Jessica’s site and take her quiz here. Cailen Ascher is a business and lifestyle coach whose name has become synonymous with the 3 Day Work Week. Imagine growing your business and making more money while working less hours. Sound impossible? Cailen will show you it’s completely do-able with her powerhouse community anchor. Today we’re chatting about where the idea for her 3 Day Work Week came from and how she leveraged it to build her incredible brand! Today’s episode centers around a topic I’m super passionate about. It’s pure magic when you listen to your audience and build something they actually want!